Consisting of seven bundles of 17 stainless steel wires, our 7×19 rope is available in this 7mm diameter construction which is much less rigid than many of its contemporaries. This makes 7mm 7×19 Stainless Steel Wire Rope suited to various uses where its flexibility and resilience come into their own. 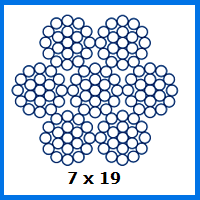 What makes 7mm 7×19 Stainless Steel Wire Rope special? Stainless steel rope is manufactured with corrosion resistance in mind. It should not rust in marine environments, nor lose its sheen due to rainfall or any other climatic conditions. That is why this 7×19 rope is not just for outdoor lifting duties, but also fulfils other practical applications. It can act as a control cable, a rigging component, a balustrade and more besides. This 7mm rope is rated for loads of up to 2,839kg and forces of 27.8kN. It is thus not quite as tough as our 1×19 construction stainless steel rope, yet still manages to gain the upper hand thanks to its ability to flex more easily. Let Rope Services Direct turn a simple wire rope order into something a bit more unique by adding fittings and concocting a compelling customised assembly just for you. The products we supply are all of a high quality and because we put everything together in-house, you can control the production process minutely. What are the ways to get in touch? You can either have a phone conversation with our team by calling 01384 78004 or chat via email when you use our contact form. 7mm 7x19 Stainless Steel Wire Rope Overall rating: 5 out of 5 based on 6 reviews.